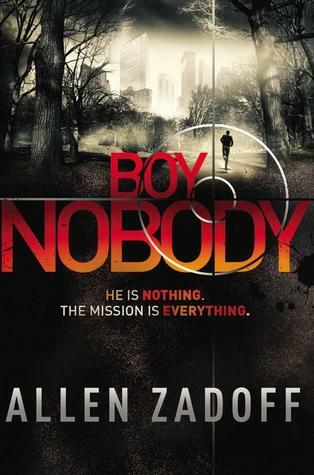 Zadoff was very careful not to reveal our protagonist’s name for most of the book, giving him an alias only when the narrative would have suffered otherwise, and always emphasizing the fact that his name, or anything else about him, doesn’t matter. His alias, Benjamin, was also used sparingly in the attempt to make him seem less like a person, and more like a well-oiled machine, completely stripped of personality, a weapon you aim at any given target and wait for it to go off. I'm happy to report that this attempt was very successful. Our protagonist – I’ll call him Ben to avoid confusion although it’s not his real name - is emotionless, but not cruel; well-trained, but not bloodthirsty; competent, but not overly ambitious. The Program killed his parents and recruited him when he was no more than twelve, and his life has been just one mission after the other ever since. He has no friends, no family, just two bosses (or handlers) he calls Mother and Father. Zadoff’s story seems to be Young Adult by accident, not by design, by which I mean that his protagonist’s age seems to be determined by the effect it has the story, and not the publishers or the market. This means that he didn’t pull any punches: the violence in Boy Nobody is not graphic, but it's constantly present. In many ways, this is a story better suited for older, more mature readers, although there's nothing to prevent me for recommending it to younger audience as well.. I just finished reading my ARC of Boy Nobody like ten minutes ago and then I checked my blog reader and found your review. You totally captured what I thought of the book. Gah, I don't know if I can review it properly. I just want to thrust it to people and make them read it. It was so awesome. So so awesome. GAH I'm still reeling over it. So I take it that is is a very engaging read. Sounds a little bit creepy but I like how the MC doesn't have his name revealed, seems to create a whole new level of suspense. I remember reading the extract you shared with us for this book a while ago and I was utterly intrigued, I'm glad that the rest of the book was just as enthralling. Ben sounds like a well developed character and I can't wait to get into his head and find out more about him. Also I love it when you only intend on reading a book for a few pages but get totally get suckered in! Lovely review Maja! I have to admit that I was a little skeptical about this book. For some reason even though I loved the cover and thought that the premise sounded great I had it in my mind that I wouldn't enjoy. But wow, a book that kept you up all night, huh? This is now going on my GR tbr! Brilliant review as always, Maja! Your's is the second review I have read on this that was a glowing one and the funny thins is that before last week, I had no idea this book even existed. Now I must read it. The fact that this story gave you a book hangover is a ringing endorsement Maja! I love too that Ben is an unapologetic character, I'm always drawn to the honesty of those types of characters, regardless of whether or not I agree with what they do. I love that he is what is, and you can either take him or leave him:) I honestly didn't have much of a desire to read this one, but with that high a rating for you I simply must!!!!! Ok so what's this with not revealing his name? *intrigueness increases 10-folds* it sounds like a fantastic character though I like how he makes him genuine and doesn't make excuses for him like you say. That is definitely not a cookie-cutter character! Yay! I really liked this one too! I loved how cold Ben was but how we got to see him begin to open up and his past start to creep up on him. Also how well done was that twist? I had no idea! Love the way you wrote this review! Oh too bad that caffeine doesn't keep me awake. So, I'll have to remember to start this one early ~waaayy before nighty night time. :) I have to say, I'm quite curious about Ben. It's hard to write a sympathetic character who is a killer. Not in the way that you feel bad for him, but that you get a feel for the character. Oh I'm curious! Brilly review! Don't you love it when you get swept you away and kept you reading way late. I love that this is differnet from your typical YA book and I love that is packed full of action. I know you have been wanting this one for awhile and I am taking notice. I will get it read! I loved the Chapter One excerpt that you shared a while ago and now that I've read your review, I know I'll have to pre-order this. Thanks for sharing how much you enjoyed reading the book! Its amazing how gripping some books can be, causing me to not sleep till I'm finished. Wonderful review! That's fantastic that the protagonist stays true to his identity the entire story. Definitely want to read this unique story! Is it that good? This book intrigued me but I never picked up a copy. I think I'll reconsider this now. Great review Maja :) I'm really interested in seeing how Ben's mind works. Thanks for the review Maja, I'll be definitely giving this one a look asap. Wow! I think I kind of wrote this one off because it sounded like yet another overdone dystopian plot (must learn to read blurbs!). But I love the idea of this one, the maturity, and the way the protagonist is presented throughout. Adding to my wishlist! Oooo.. I hadn't even really given this book a second thought, but it sounds damn good. I really had no idea. Wonderful review! I've read a couple books by this author but Boy Nobody sounded like such a new and different approach from him, I wasn't sure what I'd think. Sounds like a very intense novel with a great psychological approach. Thanks for the review; I need to give this one a shot now. Ooh, it's always so nice and encouraging to hear that you stayed up late in the night to finish the book! Exciting!! I am a bit conflicted about the MC though. On the one hand, I can't imagine being able to relate to such a character, but on the other hand, his characterization does sound particularly well crafted. And hopefully I would still enjoy the story even without being able to relate to anyone. I want to read this one now so thanks for this review then, Maja! I don't think I've really heard much about this one but I'm sure intrigued! Having to stay up to finish it is definitely a good sign! It sounds pretty twisty too, which I love! I've seen this book on your blog and now I really want to read it. It sounds really different and I remember the trailer - it was awesome. I'm so glad that you've enjoyed this one. Great review Maja. PS. I know how you feel btw, cause last night I've started reading The Sea Of Tranquility and I have a hard time to get read for the class. I myself love when I find treasures like these hehe I been found reading to the wee hours in the mornings on my kindle as well just so I can find out what happens. This looks awesome and intense and well written with interesting characters. Loved your review! WOW. this is another book that I had written off by previous reviews. But I love books about assassins, and the fact that this author doesn't sugarcoat the protagonist. You make this story sound really awesome!